Tempo Properties Sdn Bhd, the developer of "The Atmosphere", a mixed commercial development project, is targeting a return on investment (ROI) of up to 25 per cent over the next three to four years. Chief Executive Officer Khoo Boo Hian said the gross development value (GDV) of the second and third phases of the project in Sri Kembangan is estimated at about RM850 million. The entire project will be complete by 2012. It is also the first commercial development project in the South Klang Valley to be awarded the coveted BCA Green Mark Certification (provisional). The certification recognises the best practices in environmentally-friendly buildings design and performance. The first phase of the project has been sold to Giant Hypermarket for RM24 million. "We are now constructing the second phase and expect to launch its phase 2E in early 2011," he told a media briefing in Kuala Lumpur today. He said 90 per cent of phase two (excluding 2E), was sold out, while the construction of phase three would start next year. "We are planning to build service apartments, a five-star hotel, retail and commercial centres under the third phase. "Although 90 per cent of the development has been sold, we have decided to spend an additional RM2 million on green features, to be enjoyed by business owners," said Khoo. 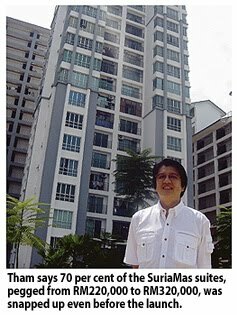 He also disclosed that Tempo is eying properties in the Ampang and Mont Kiara areas for residential development. He also stated that Tempo's future developments would continue to incorporate green elements into the design.